Executives in Africa has developed a defined search methodology, the EiA Search Process, which is formally project-managed and has been proven to deliver results, even having succeeded where other firms have not. This most important part of the assignment is attended by the whole Project Team to ensure each person understands the role first-hand. All aspects of the required fit to the role will be agreed in a Critical Requirements document and then translated into a Role Summary. These are then used to design a bespoke SuitAbility Assessment. The Project Team will thoroughly map the market, identifying and proactively approaching every suitable person for a role. This comprehensive review of the whole market ensures that our Clients can be confident that the best available Candidate has been identified when making an offer. The quality of execution of this stage by the EiA Team serves multiple purposes including actively networking and resourcing further for the role where approached Candidates are not interested themselves. It also demonstrates the Client's commitment to the appointment. Designed to address your Critical Requirements these provide a consistent template for assessing suitability. A CV-based Evidential Interview that assesses high level behavioural fit. A bespoke Written Assessment designed to evaluate critical specific skills, assess core behavioural competencies and understand leadership style. 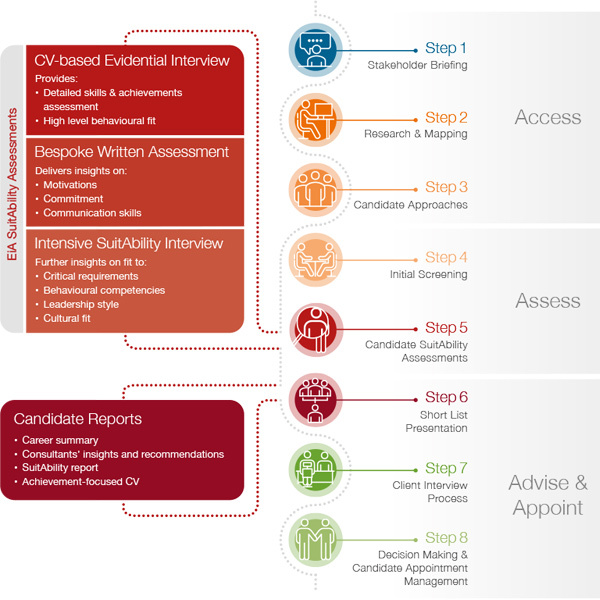 A second, more rigorous, intensive SuitAbility Assessment uses deep dive questioning techniques to understand 'how' Candidates have delivered in each of the agreed critical areas, test motivations and commitment towards the opportunity. Candidate Reports which provide detailed written insights and specific examples of experience from their career which is relevant to your Critical Requirements. Our short-listed Candidates consider the EiA SuitAbility Assessments as the first interview in the recruitment process with Client interviews being a continuation of this process. EiA works closely with our Clients to arrange the interviews and prepare the Candidates thoroughly for the process ahead, ensuring we gather feedback after each interview and manage expectations appropriately. EiA advises on final appointment decisions and will handle all offer negotiations on behalf of our Client. This is essential to maximise success at this critical stage of the process as a trusted advisor to our Candidates.